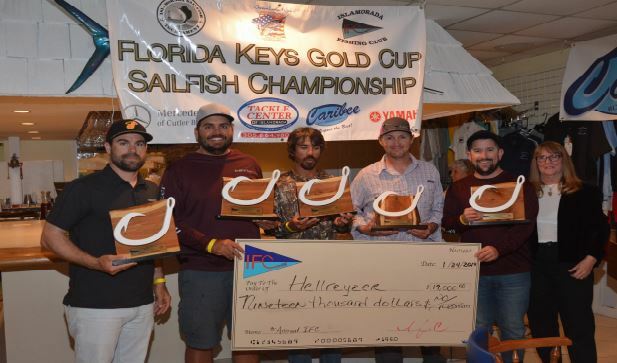 $19,000.00 in cash plus prizes were awarded to Team "Hell Reyzer" winners of the 2019 Islamorada Fishing Clubs Captain's Cup January Sailfish Tournament on January 24th with a field of 19 boats. We were very happy with the attendance this year. There were 34 sailfish released in this one day event. The awards that were presented were original Sculptures by Jimmy Mac Studios. Winning trophies were presented to Captain Ryan Alexander and anglers with 5 releases on-Time. "Hell Reyzer" Captain Ryan & His Mate Eric were also awarded custom original trophies & a check for $19,000.00. "Cloud Nine" fought their way into second place securing their spot also with 5 releases. Anglers Jake, Erik & Mike were given 2nd Place Trophies. IFC Member Captain Greg Eklund & mate Jake Turek took home trophies as well. IFC Member Captain Robert Collins Anglers Matt, Ken & Mark Fishing on IFC member Erik Akins' "Last Dance" released 4 sailfish to take home third place honors. Once again Hand Crafted Sculptures were presented to The Captain, Mate & anglers. The Islamorada Fishing Club out did themselves this time. I would like to commend the entire staff for a job well done. Our anglers loved the food, drink and good time we had. The next tournament in the fishing club's series is the Captain's Cup Dolphin Tournament in June. 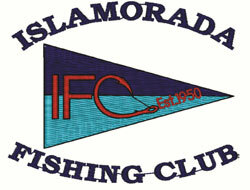 For more information on the Islamorada Fishing Club visit us online at www.theislamoradafishingclub.com. Click the button below for live scoring of the Islamorada Fishing Club Captain's Cup Sailfish Tournament on January 23 & 24, 2019!